with huge advertising displays on both sides of the vehicle, mobile billboards definitely get noticed! the media sets itself apart from the rest of the advertising clutter. mobile billboard advertising has the ability to move and be seen and be heard! we have the ability to drive your message directly to your target audience with flexible start dates and times. a driver is also at your disposal to distribute product samples, brochures, etc... transit graphic advertising offers the best advertising exposure at incredibly affordable rates. transit graphic advertising can create awareness for your new customers. advertise your business, product and/or service to the convention or trade show attendees or as an exhibitor, use transit graphic advertising to increase awareness at your booth. expose your new product and/or service by taking your ad directly to the point of sale, i.e. malls, grocery stores for new products; neighborhoods, business districts for new services. create excitement for events such as concerts, sporting events, car shows, golf tournaments, festivals...transit graphic advertising can make any special event even more exciting. this is powerful exposure for critical times. whether you are a candidate seeking elective office or an organization striving to be seen and heard by lawmakers; mobile billboard advertising can take your message to the people who will determine the outcome of the election or to the people who will represent your particular interests. 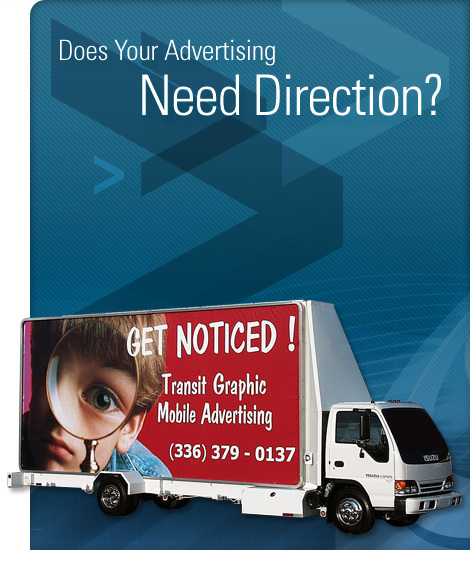 let transit graphic advertising, inc.
help you get your message seen!